Ibotta had Reese artichoke hearts on sale in the app. I wasn't sure if I even really liked them, but I decided to buy a can and experiment. I created a pasta salad and was pleasantly surprised with how delicious it turned out! Cook pasta according to package directions. Drain. Rinse with cold water to prevent sticking. While pasta is cooking, place artichoke hearts and sun-dried tomatoes in a food processor. Pulse 5 times. Add Just Mayo, garlic, and celery seed to food processor with artichokes and sun-dried tomatoes. Pulse until smooth. In large bowl, mix pasta, drained & rinsed, with artichoke sauce until evenly distributed. Fold in red peppers and cucumbers. Chill in refrigerator for at least an hour for the flavors to meld together. Stir and enjoy. This is a great recipe to make ahead for lunches throughout the week. It comes together real easy and holds up well in the fridge. I really love how well this salad turned out, and I'll likely keep artichokes and sun-dried tomatoes on hand so I can make this salad anytime I want. I'm linking up today with Farrah, Esther, and Annmarie for Foodie Friday as well as Deborah and Sarah for Meatless Mondays. Yum! I've never had artichokes in a salad before, but I should really try this out! I need more salads in my life! If you like artichokes, you might want to add some additional ones from the can. I wasn't sure about the texture, so I didn't, but I think it could be good. this looks good! I will have to try this for lunches next week! I hope you do! Let me know how you like it. Looks delicious. Artichokes aren't something I typically keep on hand but maybe I should. Truth be told, you could probably skip the pasta and just enjoy this as a dip. It would probably be delicious with some pita chips. Yup, this sounds amazing. I'm all over this!! I do like artichokes and rarely think to cook with them - this recipe looks great! Sounds yummy. 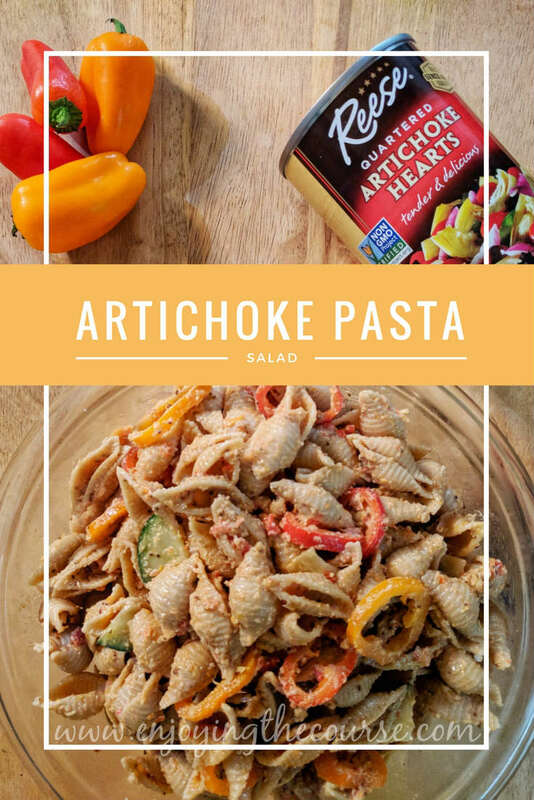 I love artichokes in my pasta salad! I think I need to try pieces of artichokes in this next time - instead of just ground into the sauce. I've never tried artichokes in a salad - this looks tasty! I seriously can't wait to try this! I just discovered Just Mayo since starting my 21 days vegetarian. I love it! Isn't it good! I've been using it for years and don't think I'd ever go back to regular mayo. I LOVE artichokes! I am def going to have to make this soon! Several of my fav foods included in the food combo! Thanks for linking up with us too! I love artichokes in pasta salad, but I've never turned them into a sauce before. I'm definitely going to need to try this! Yum! This does sound really good and like a great way to get lots of healthy vegetables into your dinner. Count me as an artichoke heart fan. I love how easy pasta salad is to make and how great it is to have on hand in the fridge. I might have to whip up a batch soon, thanks for the reminder! You're so welcome! They're so great to make ahead for lunches. Ohhh I love artichokes so much! 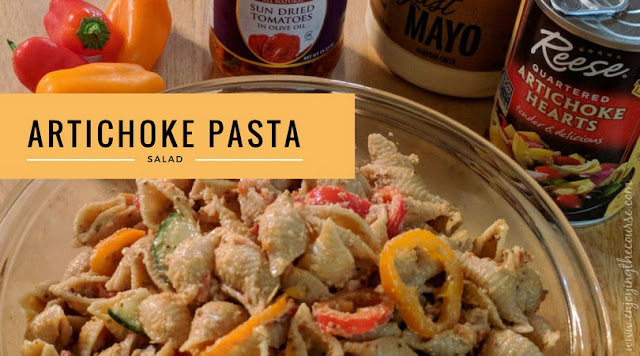 What a great pasta salad recipe.